Oscar usually loves spending time outside rooting around and eating grass. However, it’s been cold here lately, and Oscar absolutely hates being out in the cold. 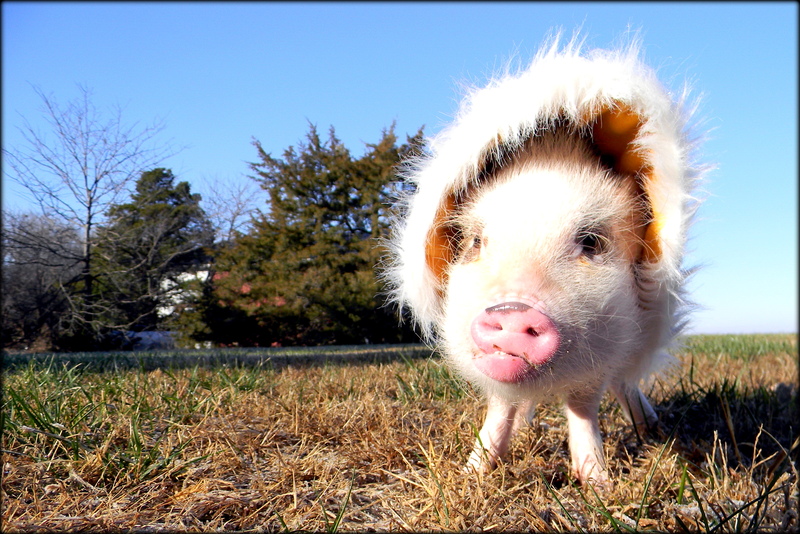 To help make him more comfortable outside during the winter, I decided Oscar needed a mini pig coat. 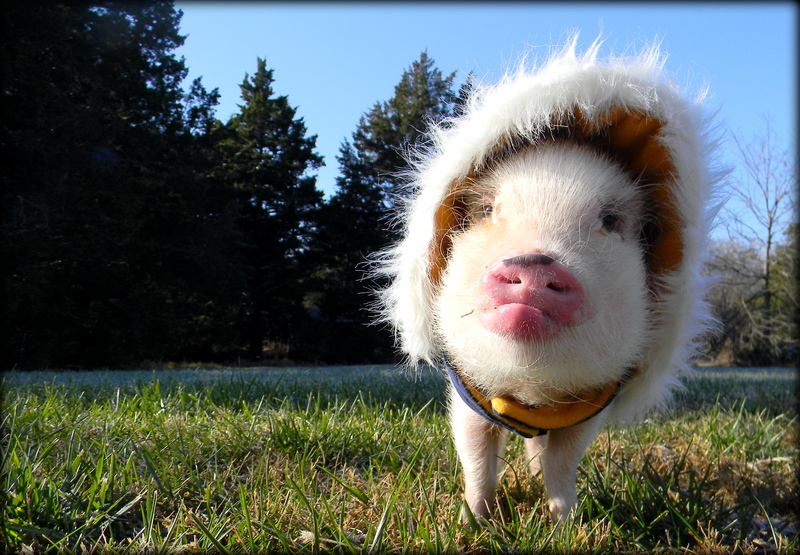 I initially considered buying Oscar a coat, but mini pig coats are hard to find. 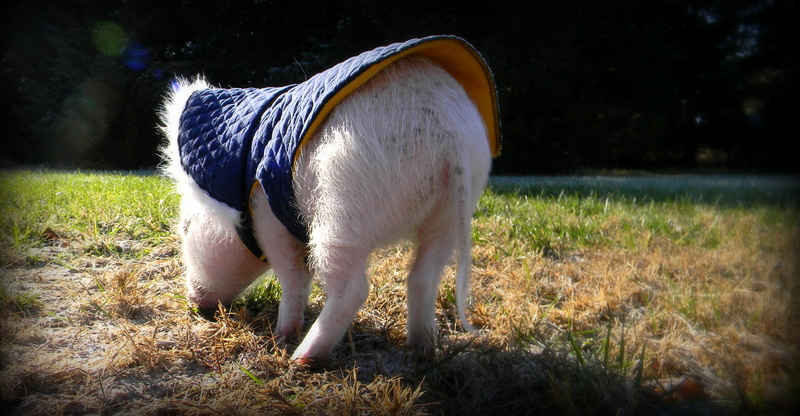 Dog coats are an option for mini pigs, but they don’t work well for potty breaks. Oscar doesn’t use an indoor litter box and instead goes outside to potty several times a day, so it’s important for him to have a coat he can wear during his potty breaks. Unfortunately, most dog coats are cut too long in the abdomen and don’t work for mini pig potty breaks. Since I wanted Oscar’s coat to be cute but also practical, I decided instead to sew a mini pig coat for him. 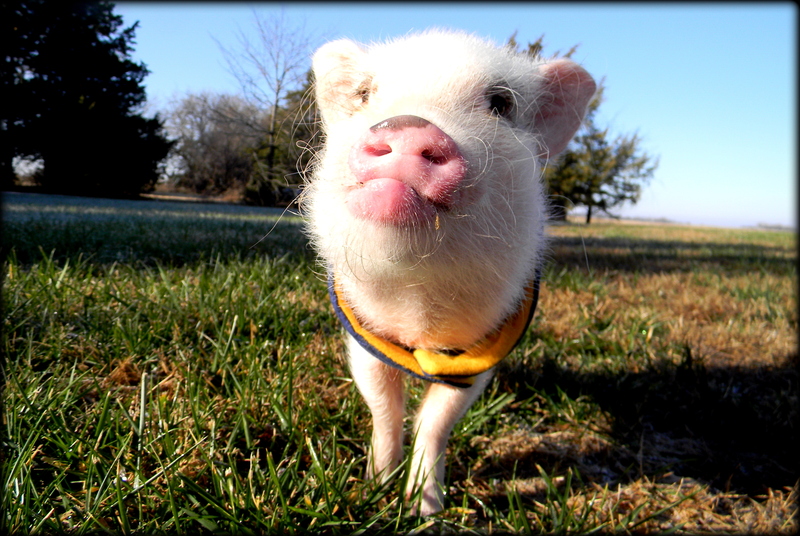 Mini pig coats and clothes are typically designed so that the straps are closer to the front legs, leaving a gap on the abdomen for potty breaks. I wanted Oscar’s coat to be warm but also easy to put on and take off. Also, I wanted him to have a hood for really cold days, so I made the hood separate and attached it with snaps. The hood took some getting used to for Oscar, but now he seems to like that it goes completely over his ears and keeps his head warm. Oscar’s coat with the hood snapped on for really cold days. Oscar’s coat without the hood. I wasn’t sure how Oscar would feel about his first coat, but he seems to like it. It doesn’t get in his way, and he stays much warmer while he’s outside. He can use it for outside potty trips, but he also wears it just to root around. Even with the coat, he never wants to stay out for long in the cold, but his coat allows him to stay out a bit longer than he could without it. Now he just needs some boots to keep his little hooves warm in the frosty grass! Thanks! I’ve thought about it and might try making and selling them someday! A pink one for little girl piglets with the fuzzy hood would be really cute. Love the name Heidi by the way! Hi Ali! I’ve actually considered posting my pattern, but I need to do some work on it before it’s ready to share. It’s just a quick draft I put together with Oscar’s measurements so that he would have something to wear. But, I’ll do some work on it and see if I can create something I’m proud enough to post and feel confident having people use when they’ve purchased fabric and put work into sewing. 🙂 In the meantime, I definitely recommend checking out Snort Life’s Etsy store if you haven’t already.